In Layar, users can share screenshot on Facebook and Twitter. It is also possible to have users share a screenshot to a URL of a developer's choosing. 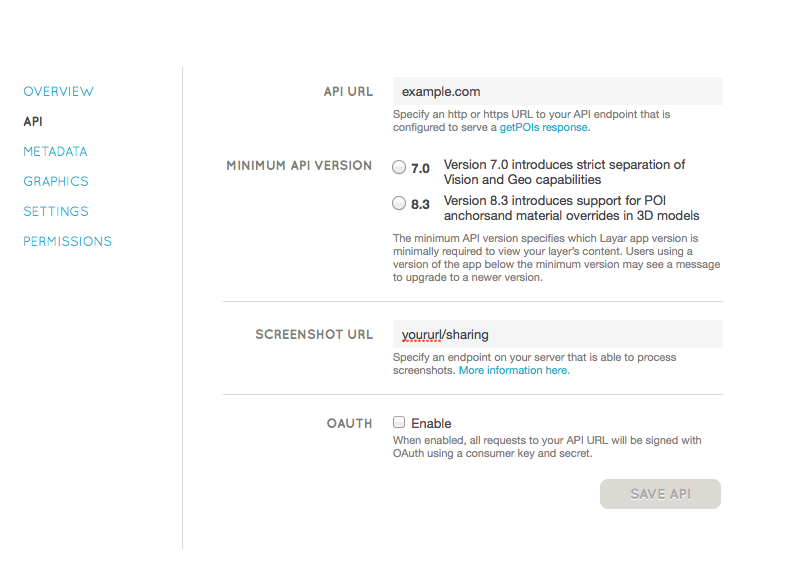 The URL to which the screenshot will be posted is configurable on the Layar publishing site, in the same tab as the API endpoint URL. If a URL is entered there, a new sharing option will appear on the "screenshot sharing dialog" in the Layar client after a screenshot is taken, next to the Facebook and Twitter options. When selected by the user, Layar will upload the screenshot file to the specified URL as if it were a file uploaded through a web form. In other words, the request will be an HTTP POST with MIME type multipart/form-data. Most web platforms/frameworks will handle this automatically. For example, in PHP uploaded files will be placed in the $_FILES array. This screenshot was taken with the Layar Reality Browser!